Conversations I. Artists Select Artists. Invited artists participate in Live Auction and Silent Auction benefiting Hudson Valley artists and Garrison Art Center. May 13th, 2017. Viewing 3:30 - 5:00. Live Auction 5:00 pm. Silent Auction May 13th - May 21st. 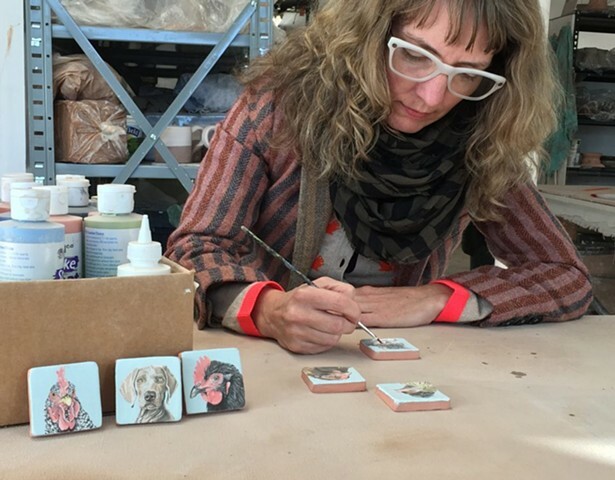 Ceramic tiles, handmade and hand painted with underglazes of animal portraits by Chantelle Norton. Shown here in work before tiles are bisqued, then glazed and high fired. Invited artists participate in Live Auction benefiting Hudson Valley artists and Garrison Art Center. May 11th, 2013. Viewing 3:30 - 5:00. Live Auction 5:00. Silent Auction May 11th - May 19th.